Et Verbum: The Condition of the Suffering souls in Purgatory, by Rev. John A. Nageleisen. On the Means of Relieving the Suffering Souls. Part 7. The Condition of the Suffering souls in Purgatory, by Rev. John A. Nageleisen. On the Means of Relieving the Suffering Souls. Part 7. § 23. The Angels and the Suffering Souls. 95. From the time of our birth, when we become wayfarers on the road that leads to our heavenly home, we are favored like young Tobias with a companion and guide. "Then Tobias going forth found a beautiful young man, standing girded, and as it were, ready to walk." (Tob. v. 5.) As soon as we begin our pilgrimage, behold the angel is there, though invisible to us, ready to guide and protect us. What the Lord promised to the people of Israel is done also for us: "Behold, I will send my angel, who shall go before thee, and keep thee in thy journey, and bring thee into the place I* have prepared." (Exod. xxm. 20.) Such is the service rendered us by our guardian angel on our way to heaven. He goes before us showing us the way; he protects us from dangers, and finally (conducts us to the place prepared for us in heaven. 96. His power, by which he has an almost unlimited control of the visible world, corresponds with his sublimity and perfection. It is easier for our angel to move and destroy this whole terrestrial sphere, than it is for us to give motion to a smalf globe. We know from the Old Testament that an angel in one night destroyed one hundred and eighty-five thousand warriors of the Assyrian army, and it cost him less effort to do that than it would cost us to crush a worm beneath our foot. Besides, the velocity of these pure spirits is so great that an angel can pass from one place to another in less time than is required for the human eye or thought to reach the object to which it is directed. For the angels are God's ministers, employed by Him to accomplish the eternal designs of His Providence; and Holy Writ is full of examples showing us that God sent His angels to protect His servants. Thus an angel led Lot forth from Sodom ; an angel conducted Hagar in the desert and preserved her son Ismael from death; an angel brought food to Daniel in the lion's den, and saved the three youths vat the blazing furnace; an angel fought at the side of the Machabees and put to flight their enemy. In the New Testament we read that an angel gave warning to the Three Wise Men from the East to return to their country by another way; an angel appeared to Joseph commanding him to take the Divine Child and His Mother to Egypt; an angel loosed the bonds of the prince of the apostles and conducted him safely out of prison. Such is the power with which God has invested the guardian spirits of those that hear their warning, as He Himself commands, "Take notice ot him, and hear his voice, and do not think him one to be contemned." (Exod. xxiii. 21.) They cherish a great love for us; they are intent on our welfare, assist us in distress, and relieve our necessities. 97. Sin, and sin alone, is capable of rousing against us the anger of our angel. It is in his power both to punish us for sin, as also to reward us for our good deeds. "And woe to us," says St. Bernard, "woe to us, if we should provoke the anger of the angels to such a degree as to cause them to deem us unworthy their further presence and ministrations, so that we are compelled to weep and moan with the royal prophet: 'My friends and my neighbors, have drawn near and stood against me: and they that were near me stood afar off, and they that sought me used violence.' " (Ps. xxxvii. 12.) A punishment like this should make us fear and tremble. In Holy Scripture we find many examples of angels visiting sinners with the punishments they had incurred. An angel killed seventy thousand by the plague during the time of David. An angel killed one hundred and eighty-five thousand in the camp of Sennacherib. An angel punished Heliodorus for his sacrilege by covering him with sores. Angels pour the vials of God's wrath over a sinful world. Finally, the Gospel assures us that the angels will go forth at the end of the world to separate the just from the wicked, and to cast the latter into the fiery furnace, where there will be weeping and gnashing of teeth. How dreadful, if the very angels, to whose care we are now committed, should be the ones commissioned to execute this terrible sentence on us! Is this not a reason to fear their power ? Should this thought not move us to fulfil with the utmost fidelity our duties towards our angels ? 98. If we but listen to and follow their inspirations, our angels will be a most potent help for us in the hour of death. They will strengthen us against temptations; they will comfort us in our agony; they will conduct our souls to judgment; they will console them in Purgatory. They are not content with performing in our behalf all the services imposed on them by God, but desiring most ardently to see us truly happy, they are intent on obtaining for us from God all the graces and favors conducive to our eternal welfare. 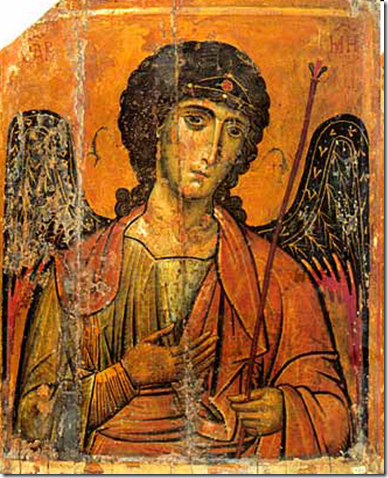 The guardian angels therefore pray for their clients at the throne of God; according to St. John's vision in the Apocalypse, they bear their tears and sighs into the Divine Presence; they unite their own supplications with those of their wards to move God more effectually to mercy. They exclaim, according to the prophet, "How long wilt Thou not have mercy on Jerusalem" (Zach. 1. 12.) and on this troubled soul?_ Now, God willingly hears the prayers of His servants and friends, and grants great favors to those for whom the angels pray thus assiduously. The angels, we may therefore be certain, are continually in attendance on the suffering souls of their clients in Purgatory; it is their most ardent desire to alleviate their torments. From Purgatory they come to this world to gather diligently the good works performed for the Suffering Souls; they inspire the faithful to pray for them, to labor for them. Ascending to heaven with their harvest of suffrages, they descend thence into Purgatory to fill the Suffering Souls with consolation by announcing to them the abbreviation of their torments.—Of the patriarch Jacob we read that he saw in his sleep a ladder reaching from the earth to heaven, on which angels ascended and descended. They ascend to present to the Almighty their petitions in favor of the Suffering Souls, and they descend to bring to the souls in Purgatory the favors which they obtained for them from God through the good works of the faithful on earth. Boudon maintains that the angels inform the Suffering Souls of the happenings in this world about which these Souls are concerned; that they reveal to them who are their benefactors, exhorting them to pray for their benevolent friejids, in doing which these good spirits gladly lend their assistance. St. Augustine says, "The departed may be informed by the angels of things happening in this world, in so far as this is permitted by Him to whose judgment everything is subject." However, it may also happen that certain Suffering Souls are deprived of the aid of their guardian angels, of the Blessed Virgin Mary and the saints, because they were not devoted to them during their life on earth, or neglected to aid the Suffering Souls. Blessed Margaret Mary Alacoque saw souls in Purgatory who were sentenced to forego the assistance of Mary and the saints, because during life they had lived in discord with their superiors.